A fresh take on neutrals. La Pearla is shapely and sophisticated. 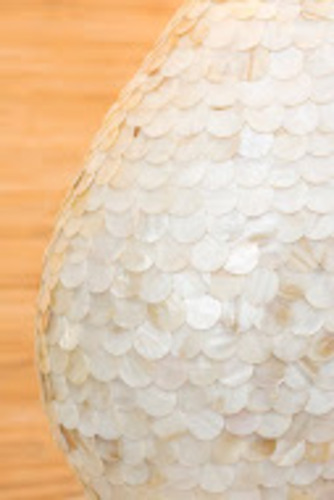 A gourd-shaped silhouette with overlapping buttons of mother of pearl on a simple oval acrylic base. 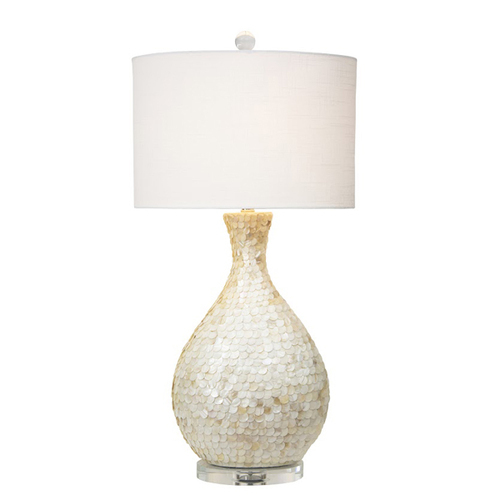 Topped with an oval white linen hardback shade measuring 11/17" x 11"H. You'll give this lamp glowing reviews for its great shape and warm finish. Due to the handcrafted nature of this lamp, colors and patterns of mother of pearl will vary from lamp to lamp. Each lamp lamp is unique. Measures: Base 11/17" oval x 34.5"H.